Japan's cherry-blossom season has arrived a bit early this year. 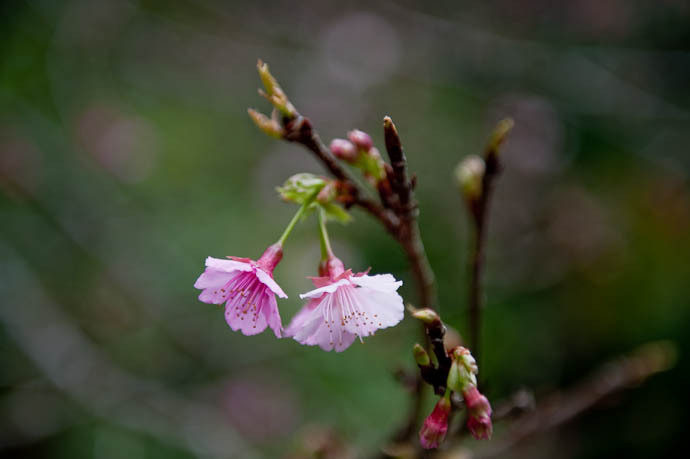 During a drive in the mountains yesterday, we came across some cherry blossoms that were just starting to bloom. I normally don't post new cherry-blossom pictures until mid-to-late March (last year's “It Has Begun: Cherry Blossoms in Kyoto” went up on March 25th), although new plum blossoms do come a month earlier, with 2007's first plum-blossom post arriving in mid February, and last year's “Plum Blossoms at the Kitano Tenmangu Shrine” just catching the tail end of the plum-blossom on March 24th. These rumply sakura were either somewhat deep pink, or almost pure white, but not much in between. The two colors could co-exist on the same branch. Cherry blossoms in the first week of the year. In the mountains. In Japan. Who would'a thunk. 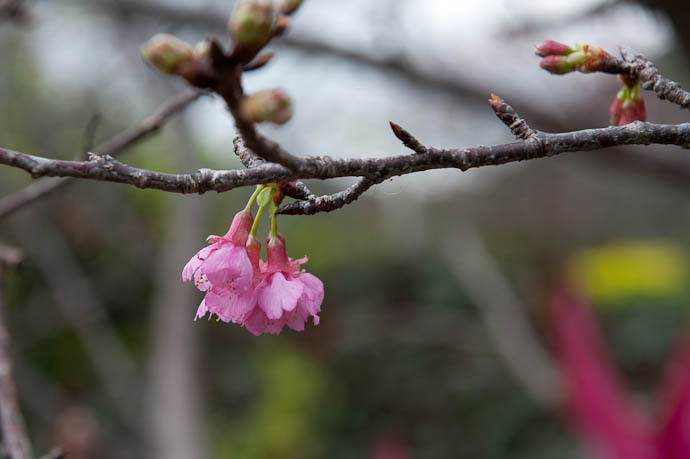 I’m sure you are right in calling these kanhizakura, which is Prunus campanulata, distinct in its early flowering (early to mid-March in Tokyo, apparently), and its deep pink flowers. The frilly one is interesting, and I would guess is the same species, but a curious form – also in having two flower colours one one plant. 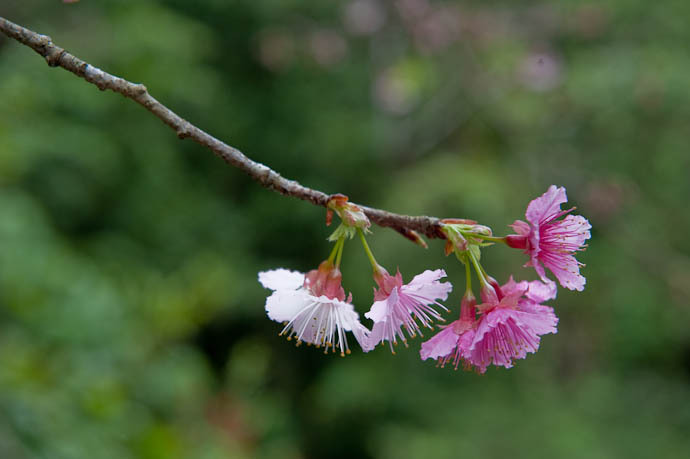 You mentioned Prunus mume (“plum”) and there is a cultivar of that, ‘Omoi-no-mama’ which also can have white, pink, and even bi-coloured flowers. Kanhizakura grows apparently wild in Okinawa (I had a look at the exif and map!) but is thought to have been introduced there long ago from Taiwan. It is not considered very hardy, but there used to be a large tree in woodland at the Royal Horticultural Society Garden at Wisley in Surrey. Hoping for some more photographs of Okinawa. 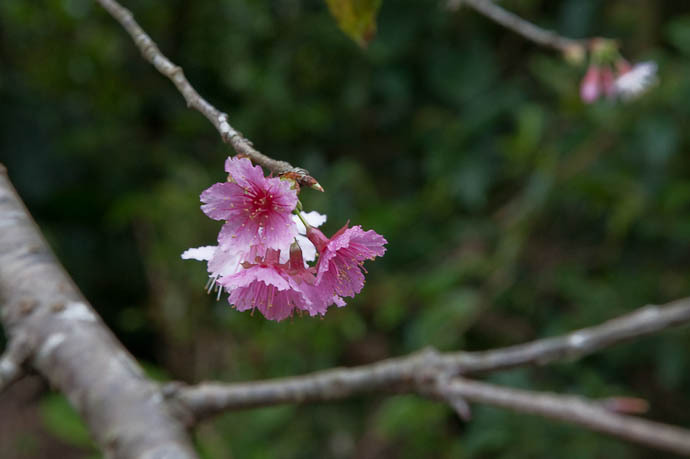 Indeed, as Peter deduced, these blossoms are in Okinawa, way down in the South China Sea. 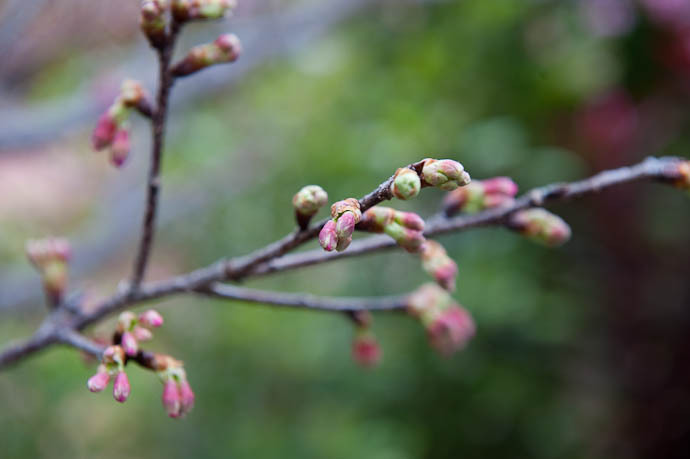 The locals told us to expect cherry blossoms in late January, so they are indeed a bit early. No cherry blossoms yet in Kyoto, and none expected until late March…. Well, it seems the observations of Sumisu were quite accurate . I admit to being somewhat puzzled by your response. All is clear now, especially since Peter added his insight. And were you aboard a boat when you took that neat island shot? As I was researching on the cherry blossom season, I came across your beautiful work which sidetracked me onto a path of visual feast amidst the story told in each of the photograph. I will continue to make travel plan to Tokyo and hope to be there for the blossom. Thanks for the experience!! My family and I are all excited to see the cherry blossoms bloom. Hope we can watch them by end of March. Is this the best time to watch or better if 1st week of April? Hi there, I will be in Tokyo from mid to end of March. Probably related to an earlier question but how likely am I to catch the cheery blossoms there? blossoms. Your photo’s help me know how beautiful Naze and the surrounding area is. Thank you for sharing your photo’s. I am from Barcelona Spain. I like to visit Japan in 2010 during the Plum and Cherry blossoms, please suggest in wich place and period will be the best. End of March? and location ?? Nice photos youve posted up on cherry blossoms!